1. It has been four years and we are still replaying our every move like a chess game that just won’t quit. If only we had declared bankruptcy before falling into pre-foreclosure, then we might have had a chance to save the house. If only we had listed the house at the price we paid for it right away, we would have found a buyer immediately, thus avoiding the need for a short sale and subsequent bankruptcy. If only we hadn’t dumped all of our savings into a renovation. If only we had never bought the house. That’s where the “if only” chain of thought always ends. If only we had never bought the house. Well, I shouldn’t say it ends there. It pauses there. And hangs for a beat. So… why do we keep torturing ourselves with “what ifs” still four years later? Perhaps we feel that if we can play the right moves, we won’t repeat the mistakes in our future. To me, it always feels futile. I mean, who knows how events would have unfolded if we had never bought the house. We might have been reckless in some other way that could have devastated our finances. The lessons we learned from our brush with foreclosure are the lessons that make us savvier today. We didn’t know that then. And we didn’t even know that we didn’t know that. We’re smarter now BECAUSE of everything that went down. Bob first bought up bankruptcy protection when we were about to miss our first mortgage payment. He wanted to look into it then. He was thinking of it as a business decision. It’s called bankruptcy protection for a reason. He wanted to protect our assets; I wanted to be a good girl. I saw bankruptcy as a shameful failure and one that should be avoided at all costs. I was unwilling to consider that it was a viable choice. I was unwilling to consider that we might eventually be forced declare bankruptcy. I had fixed my mind on salvation. We will get out of this mess. Somehow. We won’t have to declare bankruptcy. We avoided foreclosure, but ended up short selling our home and losing everything in the process. And we found ourselves cowering under the protection of Chapter 7. We no longer had any assets to protect. What we were protecting now was our future. See, we were worried that the bank would wait for us to get back on our feet and then come after us for the difference from the short sale. Had I been willing to give up my judgements about Bankruptcy, we might still have our house today. And if we had been able to hold onto it, we would have a major asset in today’s rebounding housing market. I don’t allow myself to think about that very often because it’s neither here nor there. I really am “oh well” about it. Because we are where we are. We are back on our feet. We’re not homeowners. We’re still in debt. But we are much better off than we have been for many years. I’m focused on creating our future, not rewriting our past. That’s not to say that I don’t occasionally find myself daydreaming and playing that alternate reality game. The “what would our life look like today if we never lost the house” game. But I quickly see the danger in that and shut it down. How can you learn from us? Do not fool yourself into believing that everything will be okay so you don’t even need to become familiar with the B-word. That’s what I did. And I regret it. Learn. Investigate. Interview the B-Word and learn about all of its many complexities. Learn about how it will impact your credit. Try to determine if it is worth it. The more you learn now, the better. Try to separate your feelings about bankruptcy. I would suggest looking at it from a matter-of-fact business decision. Try to view this as a potential business decision. Subtract the emotion from the fact-finding. You could even set up a meeting to talk to a bankruptcy attorney just to better understand your options. I wasn’t even willing to do that because I really believed the worst couldn’t happen. Then it did. And it was too late to salvage our assets. You don’t have to make my mistake. Ground yourself in reality as early in the process as possible. And remember, just because you’re talking about Bankruptcy, doesn’t mean you’re surrendering to it. I’m not advocating running for the cover of Bankruptcy before trying anything and everything else. I’m just saying that you don’t want to wait until it’s too late. Until you really are left with nothing. It’s a very tricky and emotional thing. I completely understand that. And I don’t have an answer to the question, When should I declare Bankruptcy? And if I did claim to have an answer to that question, you shouldn’t listen because I AM NOT AN EXPERT. I am not an attorney. I am just a writer who wishes she hadn’t been so afraid of failing. Bankruptcy exists for a reason. Just like short sales exist for a reason. Sometimes things don’t go as planned. These are things to help mitigate the losses. We didn’t want to have to declare Bankruptcy. Trust me. I write about that here. We didn’t take it lightly. Bankruptcy isn’t to be taken lightly. If you end up there, I highly advise that you learn from the mistakes that led you down that path so that you don’t wear it thin. Instead, create a financially responsible future. As always, I greatly appreciate your sharing this with someone facing foreclosure or bankruptcy. 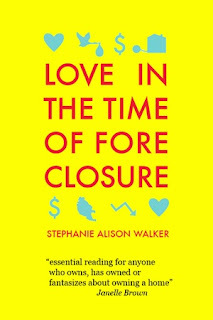 This holiday season, share some Love in the Time of Foreclosure. The eBook is available here.